It's pumpkin time! I know some of you are thrilled and some of you are less than thrilled, but I'm forging on. There are pumpkin beers in my house, dammit, and I'm going to drink them. There will be a 99 Bottles survey of the season's best pumpkin beers in the next couple of weeks. A pumpkin jamboree of sorts. But I wanted to start off by reviewing one pumpkin beer that should be of interest to New Englanders. Samuel Adams has released a double-pumpkin beer called Fat Jack for the first time. Double-pumpkin beers are always more interesting to me than the regular ones, and since this is a new beer, I'll break it out into a separate review now and then compare it to the others later. Fat Jack pours brown (my wife said "caramel", but she's more fun than me), with a rapidly dissipating head. The beer looks thick, which may be due to the use of 28 pounds of real pumpkin per barrel. Put your nose in the beer and you smell cinnamon, nutmeg, raisins, and alcohol (that's the 8.5 percent ABV talking). It smells like Thanksgiving dinner. Caramel and smoked malts combine with the spices and the pumpkin to give you a complex, hearty flavor. My one quibble is that I get a little sour gourd flavor in the aftertaste, but I might also reiterate that there are real pumpkins in here. You can probably make the connection. With this much flavor this beer won't please the Shipyard Pumpkinhead crowd, but I'm not sure that's who Samuel Adams is marketing to here. The beer pleased me, and that's all I can hope for. 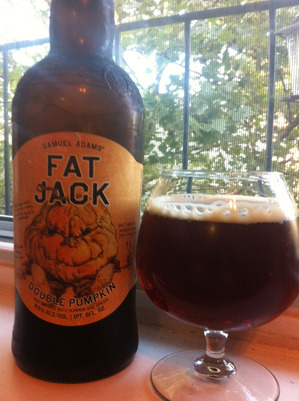 Fat Jack is a limited release. It comes in a 1-pint, 6-ounce bottle for a suggested retail price of $6.99. Gary Dzen writes about craft beer here and in the Globe when he's not covering the Celtics for Boston.com. He can be reached at gdzen@boston.com. Follow him on Twitter @GaryDzen.